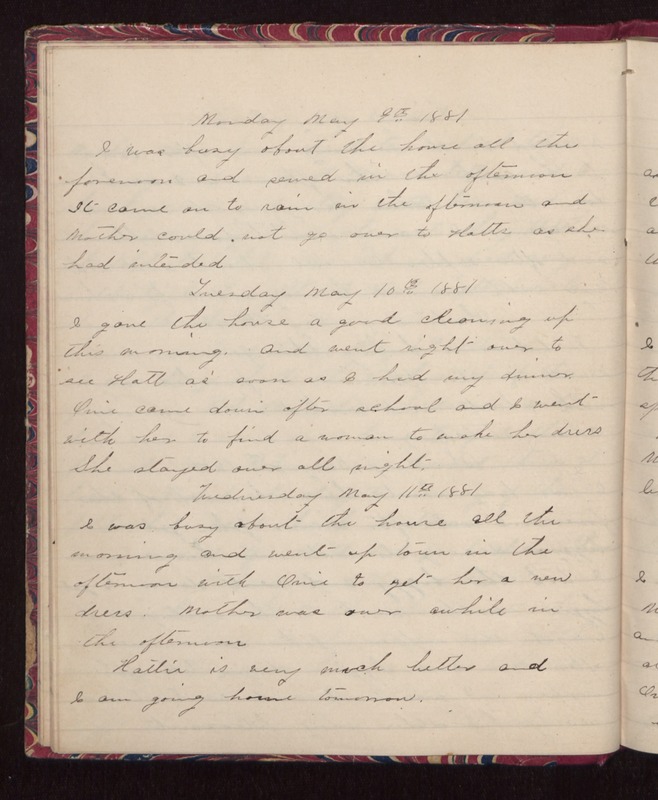 Monday May 9th 1881 I was busy about the house all the forenoon and sewed in the afternoon. It came on to rain in the afternoon and Mother could not go over to Hatts as she had intended. Tuesday May 10th 1881 I gave the house a good cleaning up this morning and went right over to see Hatt as soon as I had my dinner. Orrie came down after school and I went with her to find a woman to make her dress. She stayed over all night. Wednesday May 11th 1881 I was busy about the house all the morning and went up town in the afternoon with Orrie to get her a new dress. Mother was over awhile in the afternoon. Hattie is very much better and I am going home tomorrow.